For many years saffron has been used as a spice and as a form of traditional medicine in ancient Asian countries to treat a variety of symptoms. Saffron is found in the crocus plant and is often extracted in the form of stigmas – the long, filamentous, thread-like parts of the flower. As many as 75 000 flowers may be used in the making of one pound of saffron extract. Although this is a laborious process, recent research has found that saffron extract does yield a variety of health benefits such as weight loss and mood stability. 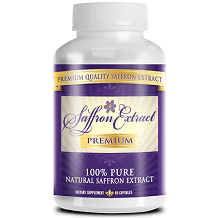 Gold Source Labs has produced a saffron extract designed to harness those benefits. This review determines the facts about this saffron extract, from its dosage to its value for money. Saffron has been implicated in a variety of health benefits. This is mainly due to its ability to increase levels of the neurotransmitter serotonin. Serotonin is an important neurotransmitter for maintaining mood stability, suppressing hunger and relieving pain. By acting in all these ways, saffron is a great supplement to aid weight loss. Not only are raised levels of serotonin important in suppressing hunger, but the mood stability they provide also discourages emotional eating. Saffron contains many vital vitamins and nutrients too, which ensures that when it is taken regularly, it contributes to keeping vitamin and mineral levels healthy. All of the above-mentioned ingredients are present in saffron or are metabolites of it, and contribute to its effects. There are also some studies which show that saffron extract can inhibit cancer cell growth and prevent degenerative eye diseases. The manufacturer recommends taking one capsule twice a day (two capsules a day). They are a little vague in their instructions as they do not specify at what times each capsule should be taken or if they should be taken with food or not. Each capsule contains 88.25 mg of saffron extract. Even taking 2 capsules a day, however, results in a much lower dosage than some research suggests is optimum, which is 400 mg per day. There appear to be no side effect warnings provided by the manufacturer for this product. Nonetheless, it is highly advised not to exceed 400 mg per day. It is also generally recommended that pregnant and breastfeeding women consult a physician before use of this product. One bottle of 60 capsules can be purchased online for $17.97. There is a discount available if more than one bottle is bought at a time – buying a three pack costs $48.87, a saving of $5.04. Gold Source’s Saffron Extract is produced in a GMP certified manufacturing facility. They also offer a total refund if a customer is unsatisfied. However, the manufacturer does not specify how long the guarantee is valid for or what condition the product should be returned in. 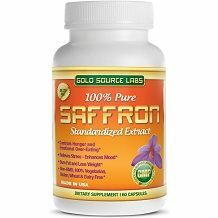 Gold Source Labs Saffron Extract contains all natural ingredients which have been shown to exhibit a wide variety of health benefits. The most important of these is the control of appetite and mood, with no major side effects. The manufacturer offers this extract at a reasonable price with an option for a discount when buying multiple supplies. On the other hand, this supplement does not contain the highest dose of Saffron available on the market and the directions for use of this product are ambiguous. Their offer of a guarantee is commendable, but use of this guarantee should be with caution because the terms of the guarantee are not stated.